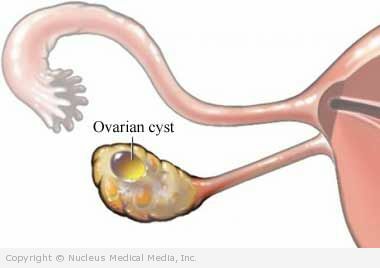 An ovarian cyst is a fluid-filled sac in the ovary. During the menstrual cycle, it is normal for a cyst to develop. Most cysts are small and benign (not cancerous) and go away on their own. Larger cysts can cause pain and other problems. Follicular cyst — This occurs when a follicle does not mature properly. The egg is not released. The follicle and egg develop into a cyst. This type of cyst goes away on its own within 1-3 menstrual cycles. Corpus luteum cyst — This occurs after an egg is released from the follicle during ovulation. Fluid builds up in the follicle and creates a cyst. This type of cyst goes away on its own in a few weeks. Endometrioma — Endometrial tissue (lining of uterus) appears to be able to move away from the uterus to the ovary. Cysts may grow and become filled with fluid (often blood). In a small number of cases, some cysts undergo cancerous changes. The doctor will carefully examine each cyst. All women who still have monthly menstrual cycles are at risk for developing cysts. Most ovarian cysts do not cause symptoms. In some cases, though, a cyst may become twisted. This can cause pain in the lower abdomen. Some cysts may also rupture releasing fluid into the abdomen. This fluid can irritate the lining of the abdomen and cause pain. The pain may be on one or both sides of the lower abdomen. Also, large cysts may cause a sensation of pressure in the abdomen. Cysts can also cause urinary or bowel problems if they press on the bladder or bowel. The doctor will ask about your symptoms and medical history. A pelvic exam will also be done. Cysts are often found during routine pelvic exams when there are no symptoms. Treatment depends on factors like your age, menstrual status, characteristics of the cyst, and your symptoms. In some cases, the doctor takes a “wait and see” approach to see if the cyst will go away on its own. If you have a functional cyst, your doctor may prescribe birth control pills. While taking birth control pills will not make the cyst that you have go away, the pills can help prevent further cysts from forming. If your cyst is causing a lot of discomfort, your doctor may prescribe pain medicine. But, if the cyst is causing a lot of pain, it may need to be removed.